I have always been a project starter. Some projects I have even finished! However, since Oscar has entered our lives, my projects have taken a back seat. In fact, I am not even sure that they are still in the car! But now that Oscar is a year old, I think I am feeling pretty good about adding some of these things back into my life. For instance, we still don’t have a kitchen back splash. Remember this post from 2008? Well, it hasn’t happened yet. In fact, despite my premature posting of my newly painted kitchen, the half that ISN’T in the picture remains unpainted. Maybe this week? I hope. And while I’m at it, I sure would love to finish that backspash, paint the cabinets and redo the floors. But lets not go crazy. I can say with some certainty that the kitchen WILL be painted before I start any of these projects, but here are a few things that are on my plate for the spring. For instance, this table. 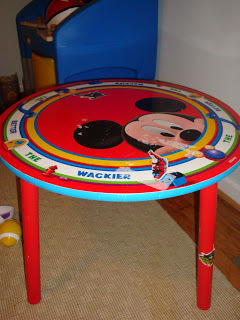 This is a table I got at a consignment sale in January for $5. I am not in love with the creepy mickey face peering on or the assortment of superhero sticker that are peeling off. So, it’s getting painted. At least white if nothing else. I am also taking over the vegetable gardens this year. After last years unfortunate “nature’s catbox” incident, well, let’s just say Jerry became disillusioned with the idea. I’ll still use the two garden boxes we already made, but they will have a new home closer to the house and in what we think will be better sun. I don’t plan to have a lot of variety this year. Just the basics I know we will eat. Tomatoes, Cucumbers, Basil, Squash. If I am still feeling ambitious after all that, I have a hallway to paint, shelves to install and closets to organize. In fact, my list is growing as I type. It feels good to get going again! Ha! I know all about putting off those projects after baby. Someday I'm going to finish painting my living room.Stopping by from Friday Follow.